I had been working a night shift and were finished around midnight. I had my camera with me, in order to make some photos on the way home (which I do very often, as you will find out, if you are reading the blog regularly). 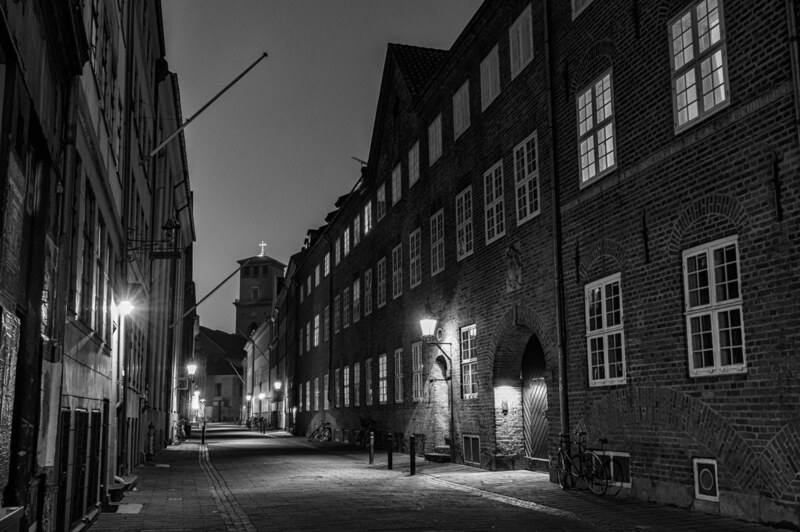 This photo was made in the heart of Copenhagen on a Wednesday evening at around. 1.am. It is not the busiest street in Copenhagen, but it says something about how little life there is in Denmark’s capital on a weekday after midnight. zzzzzzzzzzzzzzzzzzzzzzzzzzzzzzzzzzzzzzzzzzzzzzzzzzzzzzz! but I kind of like it that way. It was a 5 bracket HDR photo, but when I came home and started working on it in Photoshop/Silver Efex Pro, I kind of liked it in this fake HDR version, made from the middle (normal) exposure. Somewhere in the capital by Bo47 is licensed under a Creative Commons Attribution-NonCommercial-NoDerivatives 4.0 International License.